President Trump's revised travel ban isn't defusing concerns in Silicon Valley. 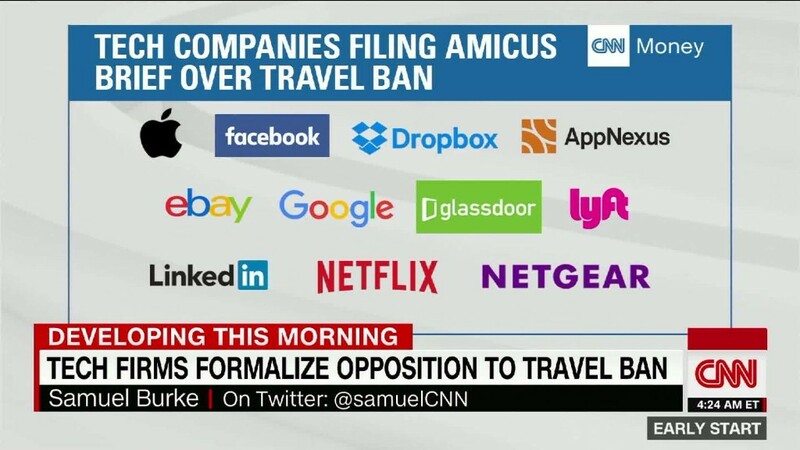 Top execs from several tech companies were quick to speak out against the new executive order on Monday, with some hinting at possible legal action. "Lyft stands firmly against this order," Logan Green, Lyft's cofounder and CEO, said in a statement provided to CNNTech. Green said he and his cofounder are meeting with the ACLU on Wednesday to "discuss how we can further support their efforts." The ACLU said Monday it intended to "keep fighting" the order "in courts." Uber, Lyft's chief rival, also spoke up against the measure. "Our sentiment has not changed: President Trump's immigration ban is unjust and wrong," a spokesperson said in a statement. "We will continue to stand up for those in the Uber community affected." Brian Chesky, Airbnb's cofounder and CEO, tweeted Monday: "Barring people from entering our country because of where they're from was wrong the first time around - still wrong..."
Shortly after the new order was announced, Salesforce CEO Marc Benioff tweeted about his grandfather who came to the U.S. as a "refugee." Without him, Benioff wrote, there would be "no Salesforce." Max Levchin, CEO of lending startup Affirm and cofounder of PayPal, tweeted that "blocking H-1B visa processing, banning countries entirely & removing protections for employees makes Canada look really attractive for tech." More than 100 companies joined a legal fight last month against Trump's original travel ban, which barred citizens of seven Muslim-majority countries from entering the U.S. The list included tech heavyweights like Apple (AAPL), Facebook (FB), Google (GOOGL) and Microsoft (MSFT). The revised order, coming six weeks after the first version, drops Iraq as one of the countries and exempts citizens who are legal permanent residents of the U.S. and have valid visas to enter the country. "A month may have passed, but it seems clear that little (if any) progress was made on the thinking behind this action," Denelle Dixon-Thayer, chief legal and business officer at Mozilla, wrote in a blog post Monday. Tech companies and trade groups are still in the process of parsing through the updated immigration order and figuring out the right response, according to industry sources. A source at Box (BOX) said the company is currently reviewing the new executive order and continues to be concerned by the Trump administration's approach to immigration policy. Reps for Twitter (TWTR), GoPro (GPRO), Salesforce (CRM) and Netflix (NFLX) declined to comment on the revised order Monday. Others like Apple, Google, Facebook and Amazon (AMZN) did not immediately respond to requests for comment.